To many there is some confusion over how one describes the relationship between two persons shown on the same family tree. The common description is usually a cousin. The Oxford Concise English Dictionary (10th Edition) states that cousin means (1) the child of one's uncle or aunt, (2) a person of kindred people. Cousin finds it's origin from the Latin consobrinus "mother's sister's child". Generally today cousin is used in context of the first meaning, until you enter the world of genealogy. First cousins are family members who have the same two grandparents as each other. In the case of you, they are the children of your aunts and uncles. 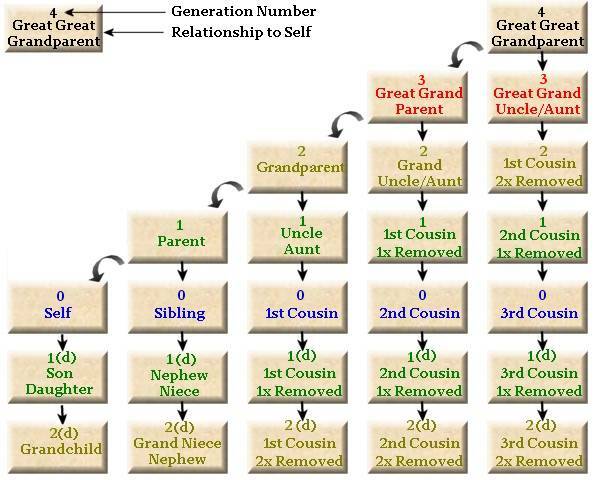 Second cousins are family members who have the same great grandparents as each other, but not the same grandparents. Fourth cousins have the same great great great grandparents, and so on. When the word removed is used to describe a relationship, it indicates that the two people are from different generations. In the case of you and your first cousins, you are in the same generation that is, two generations after your grandparents, so removed is not used to describe your relationship. Once removed means that there is a difference of one generation. As an example, your father's first cousin is your first cousin, once removed (1C1R). This is because your mother's first cousin is one generation younger than your grandparents and one generations older than you. This one generation difference is called once removed. Twice removed means that there is a two generation difference. Your grandfather's first cousin is two generations older than you, so you and the first cousin of your grandfather are first cousins, twice removed (1C2R). The description describing a cousin being removed can be ambiguous. For example, a person who your first cousin once removed may be either your father's first cousin or your first cousin's child. These are distinguished by the use of ascending or descending. Where ascending describes generations older than you and descending for those younger than you. Often only the younger or descending generations are marked or annotated as descending. Now that we have an idea of what the words mean, take a look at the chart below, hopefully it illustrates the main points.